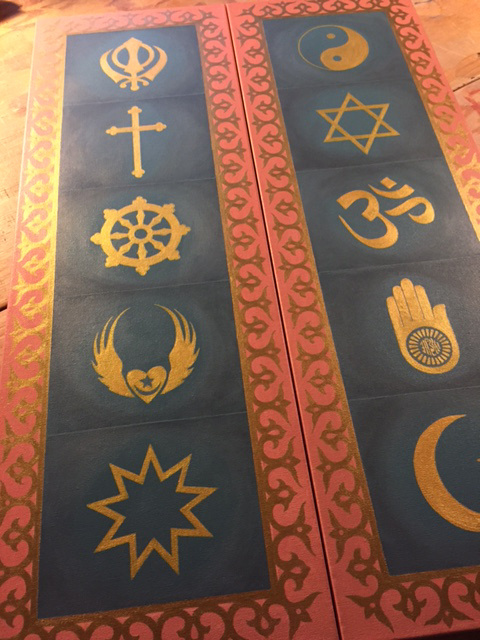 Panels for “Interfaith Tree of Hope” commission. The late Irish philosopher and poet John O’Donohue said: “God is Beauty.” When we encounter beauty, we have an opportunity to experience the transcendent. The numinous, that which takes us out of the profane and into the sacred. These are indeed holy moments and we all have experienced this especially in nature. Many years ago, I remember driving through the Okanagan region of British Columbia, high in the Canadian Rockies. I was alone, driving back from seeing a friend perform at a music festival in the area and had Puccini’s “La Boheme” in the tape deck. I had driven through this valley in the middle of the night from Vancouver airport several days earlier and had no clue as to the landscape I had traveled. At one point on my return, I reached the top of one peak at the exact moment an aria from the opera hit its crescendo and was completely overcome by awe at the profound beauty and holiness of the land before me. Combined by the dramatic nature of the music, I stopped in the middle of the road and wept. I could dwell in that space of awe all the days of my life and sense it is a longing for us all in our fast-paced, technologically driven world. What about you? Where have you experienced this sense of awe and wonder? These moments and others like them inspire my work as a sacred artist and advocate for the earth. I believe deeply that what we love, we will protect. These days, I am immersed in completing two paintings (one a triptych or three panels) for the interfaith prayer room at Providence St Vincent hospital here in Portland. The two side panels from the “Interfaith Tree of Hope” are shown here. I look forward to unveiling these paintings to you later this month. You can see other photos in process at my studio Facebook page. I appreciate your support of this holy work especially now as I walk with my father who was hospitalized again in May and is currently receiving hospice care in assisted living. There are pearls to be gleaned here even amidst my exhaustion. I see the struggle between his will to live and fear of dying for one who has no faith or spiritual grounding. I pray for his peaceful transition as a faithful witness to his journey.